uBlock vs Adblock Plus - Which One is Better & Does it Really Matter? uBlock Origin vs Adblock Plus – Which One is Better? We all hate Ads, and it becomes more annoying when there are more ads on a website or any specific page on the internet than the actual content. Well, ads on a website aren’t bad if the site is providing quality content and all the websites having quality content always have ads that don’t annoy us when we are looking at the content. But, the problem is with those blogs which are full of ads and these not only make the content difficult to read, but the reader won’t ever want to visit the site due to these ads. We all know that Ad Blockers are the best solution to block ads on the websites and even on YouTube Videos. For our browsers, several add-ons claim to be the best ad blockers, and in this article, we will be comparing the two best ad-blockers named uBlock Origin and Adblock Plus. So, let’s see which is the best add-on when we compare uBlock vs Adblock Plus. Ad-Blockers are useful as they block ads on the websites but do you think you need to block ads on each website on the web? Well, we just want to say that most of the websites have ads as the only source of revenue and most of the quality websites don’t contain annoying ads. There are just 2 or 3 ads on a whole page which surely don’t make the content difficult to see and read. So, we will suggest disabling the adblockers on these type of websites. And yes, DroidHolic also contains non-intrusive ads so, it is better to disable adblocker for it as ads are the only source of revenue for us. 1 UBLOCK VS ADBLOCK PLUS – WHICH ONE IS BETTER? UBLOCK VS ADBLOCK PLUS – WHICH ONE IS BETTER? If you don’t know, there was another Add-on that was the most popular adblocker at its time named ‘AdBlock.’ Then, the developers created ‘Adblock Plus’ to give it some competition. At present, Adblock Plus is the most used Adblocker because ‘Adblock’ is not getting any developments. By default, the Adblock Plus doesn’t block all the ads on websites. It supports websites by not blocking unobtrusive ads. So, only those ads are blocked that are obtrusive or annoying. With more than 10 Million users, this is the most popular adblocker. Now, coming to uBlock Origin, it is yet another adblocker and the biggest competitor to the ‘Adblock Plus.’ With More than 8 Million users, you can imagine how much popular this add-on is among the users. There are a lot of reasons of this, and we will be talking about them later in this article. The appearance is something we all consider in any program. The more users friendly it will be, the more it will be preferred by the users. Now, it depends on you whether you like a clean and minimal UI or a bit of classic look. In the AdBlock Plus, you will see a comparatively large box than that of the uBlock Origin. This box contains all the options from which you can Enable/Disable the Adblocker, Block Any Element, and look at the stats of the blocked ads. 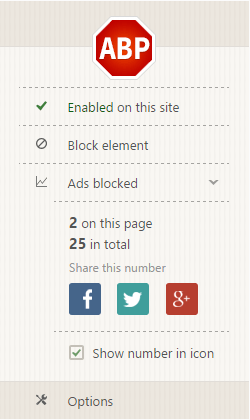 Also, you can share the number of ads blocked on your social media accounts like Facebook, Twitter, Google Plus, etc. 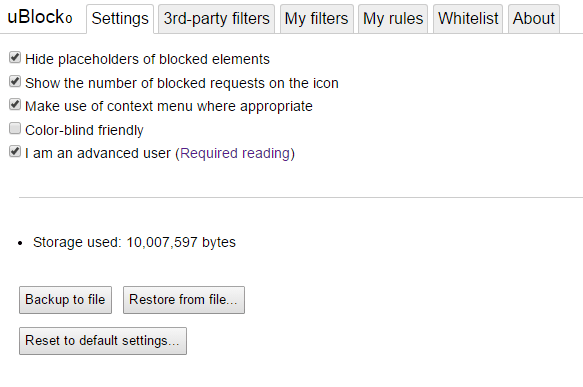 The uBlock Origin, on the other hand, has a bit of classical look with a big power button that will Enable/Disable the Adblocker and below that are some options that will let you see the number of requests blocked, domains connected, etc. Now, the main difference can be noticed in the settings so, let’s have a look at what these two have in the settings. You can right click on the AdBlock Plus icon and then, click on ‘options.’ This will open a new tab that shows all the options in the Settings. There are four different panels – Filter Lists, Add Your Filters, Whitelisted Domains, and General. As you can understand by the names, the Filter Lists Panel lets you enable the filters that you want, and it should be kept in mind that enabling a lot of filters can cause the browser to become unresponsive. Also, you can enable or disable the ads on the websites having non-annoying ads. The Next panel lets you add your filters so if you have no idea about them, no need to try adding any filter. The next panel lets you see the domains that you have whitelisted. Lastly, the General tab lets you have some general options. uBlock Origin takes a huge lead from the AdBlock Plus when we compare the options they both provide in the Settings. In the uBlock Origin’s settings, you will find a ton of different options. There are a lot of 3rd Party Filters that won’t be there on AdBlock Plus by default. One of the most compelling reasons to choose uBlock over AdBlock Plus (especially in Firefox) is that it is more efficient for CPU & memory usage. It comes with a better list of 3rd party filter lists you can enable. It also has no financial ties to the ad industry, and there is no ad whitelist enabled by default, which a lot of people appreciate. This doesn’t mean that it is not good in Chrome, but the thing is that the performance difference isn’t that much as compared to that in Firefox. Ublock origin much better because it handles the RAM and CPU better, not only in theory but fact when test drive on many computers and also it isn’t backed up by any company. AdBlock, on the other hand, isn’t better than uBlock Origin when it comes to the case of CPU Efficiency. So, it is obvious that uBlok is more CPU Efficient than the AdBlock Plus. PRICE – The uBlock Origin is Free to use with all the features, and same is the case with the AdBlock Plus, so this is a tie. Well, looking at all these aspects, there is no doubt that the uBlock is slightly better than the AdBlock Plus, but in the end, it’s all about the choice of the user. uBlock is better when it comes to options and CPU efficiency. So, if you want an AdBlocker that won’t put much load on the CPU, then uBlock is the best AdBlocker for you. 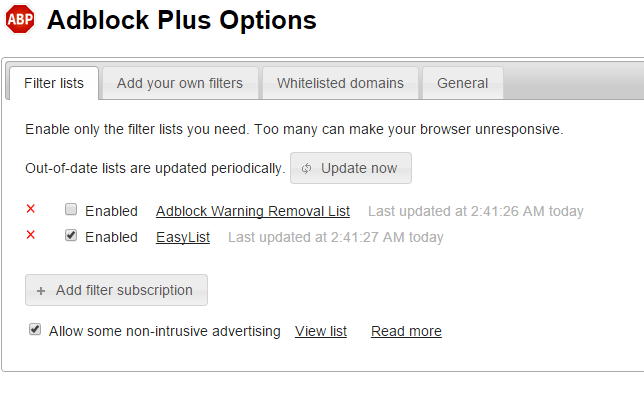 Anyways, if you are already using AdBlock Plus, it depends on you if you want to switch to uBlock or not. 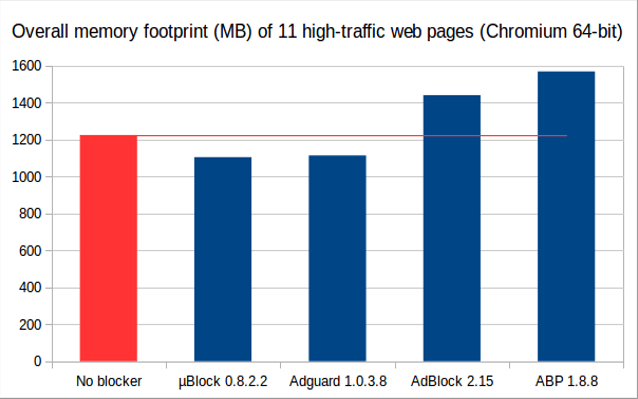 So, this ends the discussion about uBlock vs AdBlock Plus. What are your opinions? Do let us know via the comments section.